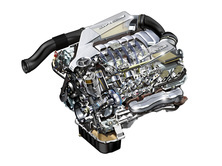 Obviously, an Engine Swap is the process of removing a vehicle's original Engine and replacing it with another Engine. This is done due to Engine failure, or just out of the desire to install a different Engine, usually one that is more modern and so more efficient, this may give it more power and/or grant you better fuel economy. Older Engines sometimes have a shortage of spare parts and so a more recent Engine replacement may be more simply and affordably maintained. Swapping over to a Diesel Engine for the improved fuel economy is a long established practice, with modern high efficiency and torque Diesel Engines this doesn't always mean you will receive a reduction in performance associated with older Diesel Engine Swaps. If you have any questions at all about an Engine Swap in Calgary, Airdrie, Strathmore, Okotoks or anywhere else in Southern Alberta, please call Euroworks at 403-291-6839 or to book an appointment, just click the blue button near the top of this page and we will get right back to you.